We’ve done interviews and some articles on people like Ron Gibian in the past, but we’ve not been very consistent in keeping that doorway wedged open. So maybe now’s a good time to push it open a little wider… and maybe keep it propped open? 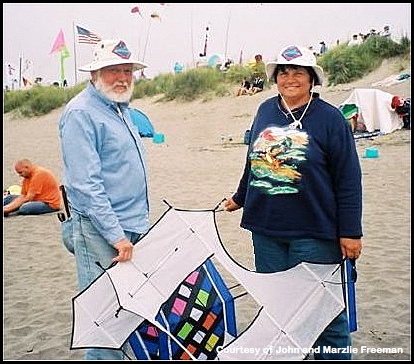 With that thought in mind, I started looking around for some kite maker to feature who’s representative of the “hobbiest” amateurs rather than any professional designers, and I came up with a couple of folks who seem to be the poster children for the genre – John and Marzile Freeman of Parksville, BC. 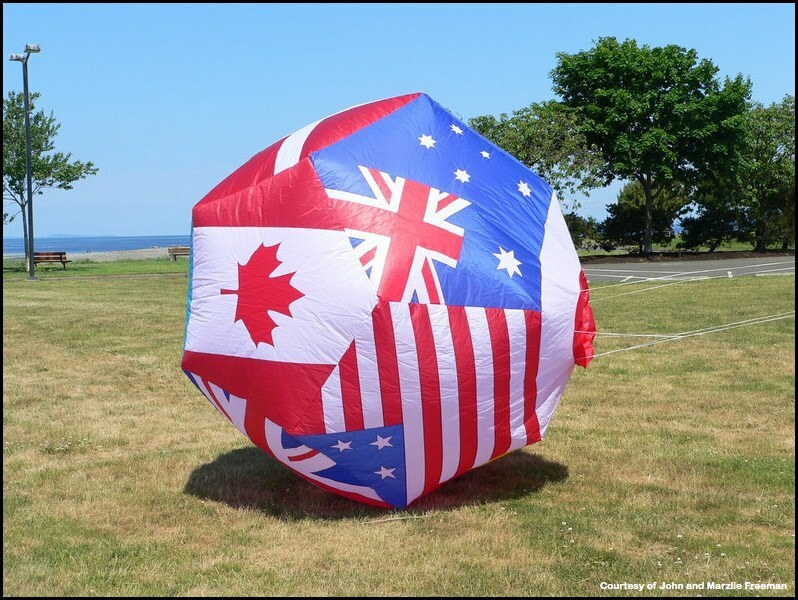 These two fine kite makers are extremely well liked in the Pacific Northwest, and are getting to be known around the USA, and abroad, as excellent kite-making workshop leaders as well. And, while John penned the answers to my questions in the following interview, please do not make the mistake of thinking that Marzile isn’t much involved. Indeed, while John is working with Kitelife on this particular interview, Marzile is on record as Editor of the Washington Kitefliers Association newsletter that just happens to share the very same deadlines. So as you will read, Marzlie is equally involved in their “Hobby,” and both of them wouldn’t have it any other way! Hi John. Let’s start this interview off the easy way. How did you first get started in organized kiting? When did that happen, what got you started, and what really grabbed your interest so that you stayed? Or did you just start out flying kites as a kid, and never gave the sport up? Marzlie and I always had a kite or two hanging around. Usually a “store boughten” parafoil that lived in the car ready for any emergency–like a nice breeze on the beach. One day, about 1990, our younger daughter came home from a weekend at the beach and exclaimed “Dad–you gotta try this!” “This” was a Trlby. (I wish I had a fiver for everybody who has gotten hooked into kiting by a Trlby!) It went from there to a Skynasaur, then to one of Catch the Wind’s sport kites. Once you got rolling, who did you end up flying with and who acted as your teacher or mentor? Did you join a club, or hang out with a group of fliers, or just fly by yourself? We quickly found and joined the Associated Oregon Kiters. What a relief it was to find that there were others who, like us, had gotten older but never really grown up. Now we belong to five kite clubs. You just can’t have too many friends! Regardless of who you hung with, by now you were probably obsessed with the “Joy of Flying.” Tell us a bit about how you felt with a kite in your hands, and how it changed your outlook. I must admit that even though rudimentary sport kites got us hooked at the beginning, it didn’t take long to figure out that flying a good looking single line kite and laying on the beach watching it was more our style. 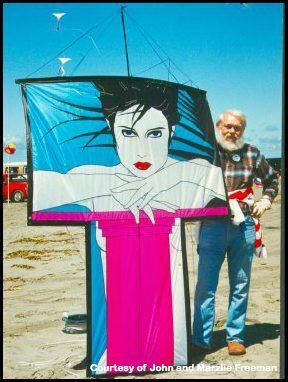 And sooner or later, you got to the point where you wanted to build your own kites. 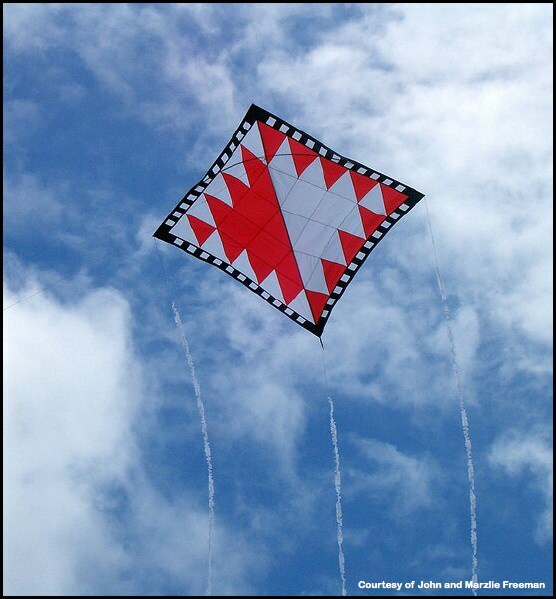 When did you build your first kite? Was that just a natural outgrowth of flying, or did someone suggest that you could build a better kite? Once you’d made your first few kites, how did kite-flying change for you? What was different? 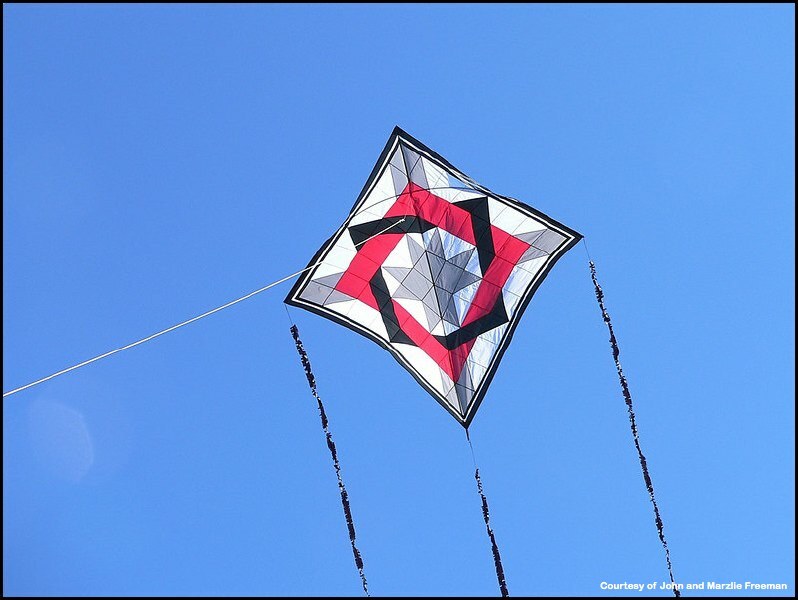 I’m assuming that not every kite you made was completely successful, so you probably made multiple versions – each one changed a little bit from prior versions until you “got it right?” How did that alter your outlook on kiting? Building our own kites changed everything. All my life I have had hobbies, and they always involved making something. I have a strong belief that the human animal has an inescapable need to create. To look at the end of the day at something that didn’t exist when the day started, and that one created oneself, gives satisfaction that can’t be gotten any other way. Much as I enjoy flying, I enjoy designing and building even more. 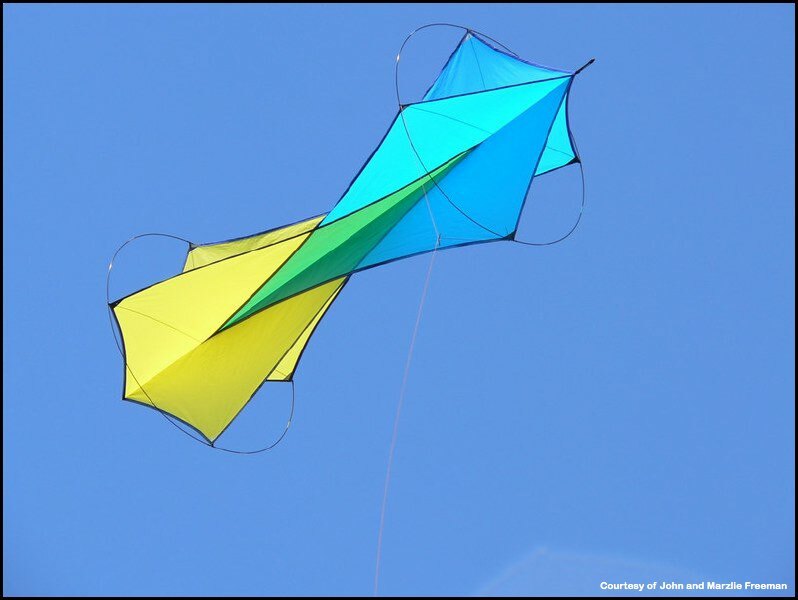 Okay – by this time, you’re probably firmly entrenched in the sport of kite-flying and kite-building… Where did you get the ideas for your next kite? When one becomes possessed by an interest everything you see is seen through the lenses of that interest. Every graphic we see gets filtered through the “how would that look on a kite” filter. Shapes get the same treatment–could we build it? Would it fly? 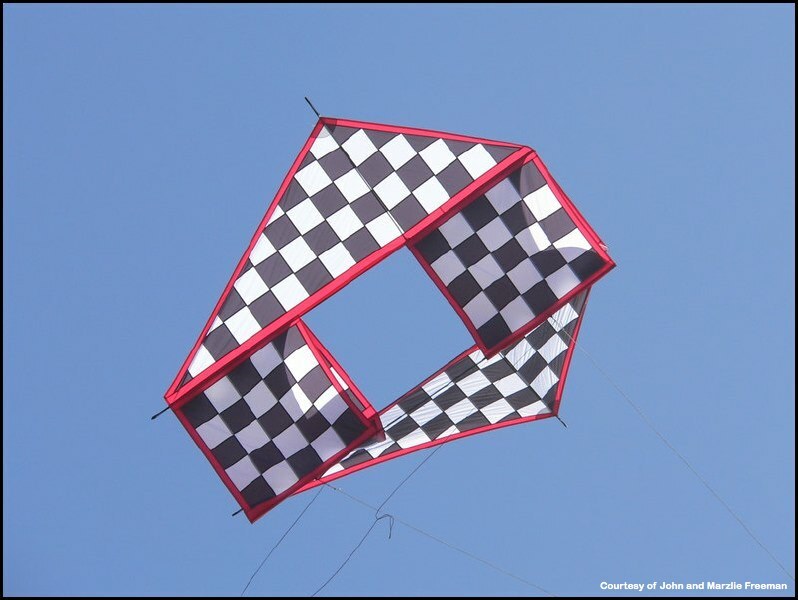 Once you had your newest, greatest kite constructed and flying well, was that enough for a while, or were you already anxious to get the next one designed and built as well, rather than just flying your current “new” kite? 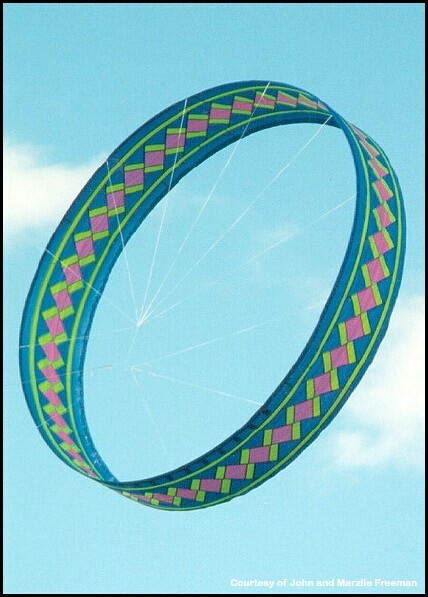 As the years have gone on the list of kites I want to build grows longer in my mind. I know I’ll never build them all. I figure if I don’t think up any new kites to add to the list, I will have to live to 149 to build the ones on the list now. There is, of course, the thing about the last kite built. 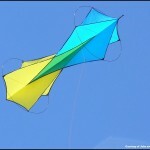 At our local festival last year a reporter from our local paper asked me what is my favorite kite. I told her “that’s easy–the last one I built is always the favorite.” Of course, while enjoying the latest the mind is always percolating with the next one. Okay, somewhere along the line it occurred to you to enter your kites in a hand-crafted kite-building competition. When did that happen, and what prompted you to want to enter a competition, rather than just building and flying? Did Marzlie or someone else suggest it, or did you just decide you wanted to do that? 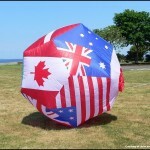 No doubt the handcrafted competition at the Washington State International Kite Festival started that for us. It looked like fun, and it turns out, it is fun! I am happy to say I am not obsessed with winning, because nobody wins them all! It does give you insight into how others think your stuff compares with other people’s stuff. Besides, it is just plain fun being out there, talking to the judges, and seeing the other fine stuff that is entered. This year at the national convention in Ocean Shores we entered anything we had in the bag that fit one of the categories. We didn’t figure to win–but it sure is fun going through the process. It bothers me that sometimes the handcrafted competition seems to be less well populated than I think it should be. I am afraid some people don’t enter because they think they will not have a chance of winning. I wish they could see that it is great fun–who cares if you win or not! 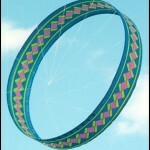 Now you’re in the “big leagues” of the single-line kites, having your kites compared with those of other kite-makers. 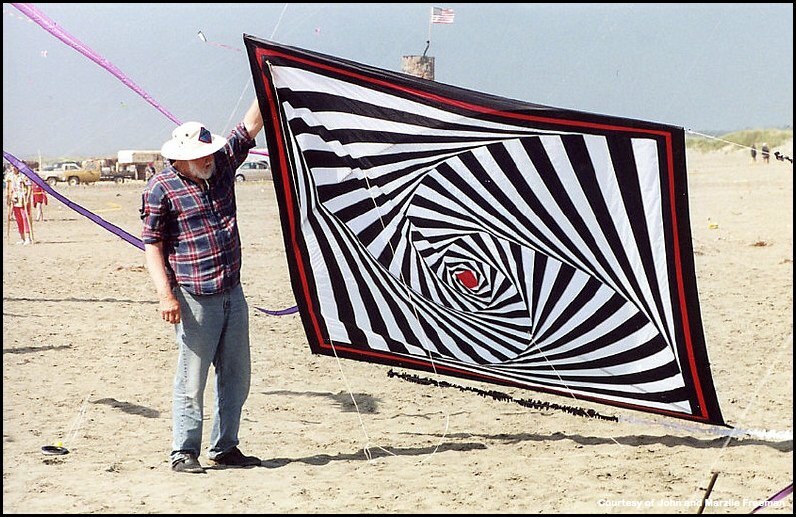 Who were some of the other kite-builders that you competed against back when you first started competing? 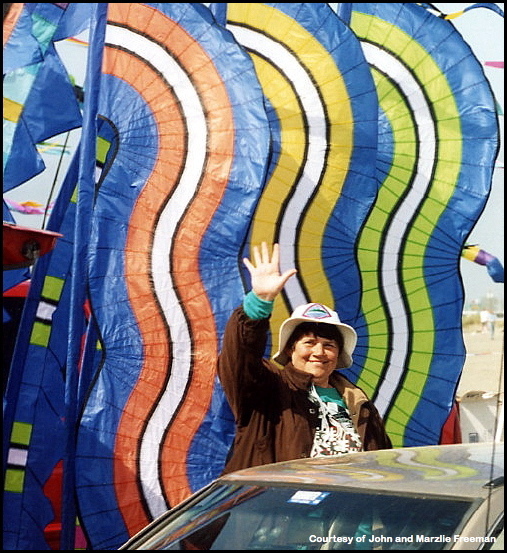 I must admit I don’t remember who I have competed against, but I do have strong feelings about those “other kite makers.” I believe kite makers to be one of the finest collection of human beings on earth. I have never run into a kitemaker, no matter how world renowned, who is not willing and eager to share everything he/she knows with us who are coming up through the ranks. The list of kitemakers to whom I owe a huge debt is long. I will not attempt to list them. 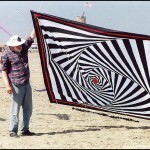 Just think, please, of all the well known kitemakers you know of–I owe them all! One of the trends in current TV fare that I lament and refuse to watch is the concept of undermining and eliminating other members of the team. This is so much the opposite of the kitemaking community, a group of folks always willing to help and support each other. Also, your work seems to generally have evolved around the Flat and Bowed and similar “sticked” kites. Were you ever interested in the Parafoils or Inflatables, or Cellular, or that strange “UFO” category? 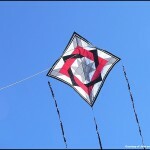 What suggested you continue with “sticked” kites, rather than going off into other design directions? 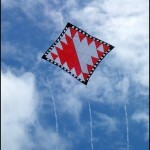 I admit that most of our kites are “sticked.” Not all, however. We have built seven “soft” kites. One of them was even a “sport” kite! All but one have been successful, and that one is patiently awaiting further experimentation. I do really like cellular stuff, and have already taught one workshop in a cellular kite–four actually, if you count Conyne type boxes as cellular. Another one is coming up at Fort Worden this next year. 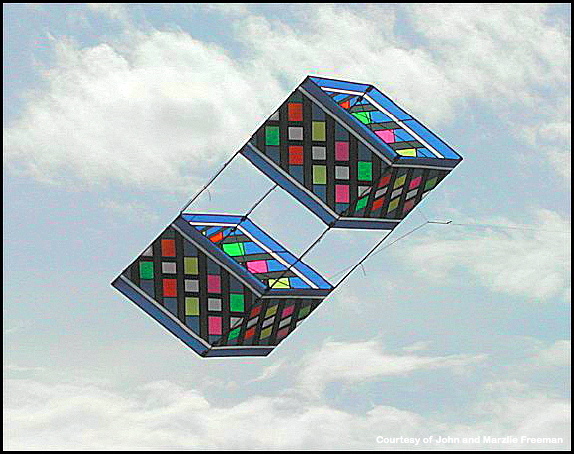 Speaking of kite “designs,” when we see a John Freeman kite aloft now, it’s usually a kite from an old design, such as the Brogden you entered at WSIKF this year, or an innovative design you’ve created yourself, such as the “Not a Peter Lynn” kite I keep seeing everywhere these days. When did you start doing the sort of innovative designing we see coming out of your shop now? And was the motivation for those kites just natural “improvements” in earlier designs, or did you intentionally plan on designing something completely new? I’m really quite curious about this one. When you sit down to design your next new “wonder,” what are you looking for when you start? 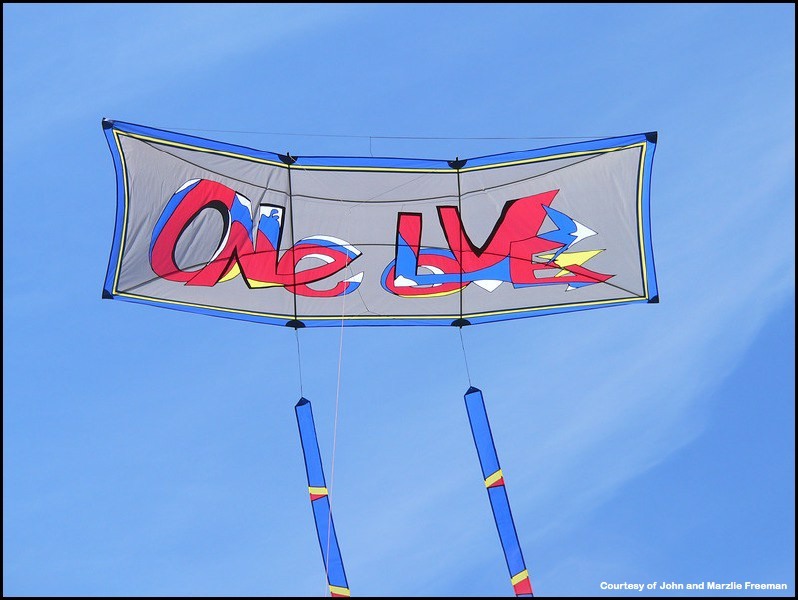 Are you principally after “beauty in the air,” or exceptional “flying capabilities,” or perhaps “technical excellence,” or maybe a good “class kite” to teach, or is there some other “factor” that resonates with you? What is it that motivates you to come up with that next new design, John? Or is it a combination of factors? To set the record straight right off, I didn’t create the “Not a Peter Lynn” design. It is the excellent creation of Greg Greger, the husband of our much loved Margaret Greger. I did greatly enlarge it and re-engineer it, but it is Greg’s design–and I love it. It looks great and flies better than great. 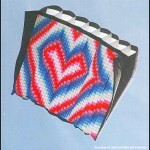 Most of our early kites were flat or bowed, and our main emphasis was on pictorial graphics. Then we got started with the Bargello quilting technique, and branched out to other quilting forms. There is always something new to try. Much innovation, whether by us or anyone else, is often the result of being inspired by someone else’s innovation. Sometimes I know what inspired it, and who, but sometimes it is lost in the mists. I try to give credit for inspiration if I can. Is there really any new thing under the sun? We keep trying to find it! 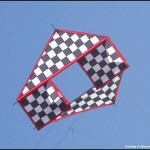 I know it will grate on the nerves of some purists, but the first thing I think about with kite design is how it looks. If I have to sacrifice some flying qualities under some circumstances in order to get the look I want — I do it. That said, when it all works, and we get the look we want AND great flight qualities–Nirvana! The Not a Peter Lynn is a good example of this. I love the way it looks, and it flies like a dream. I also get a hoot from trying to design a kite that is simple enough for a class situation, yet still interesting enough to give satisfaction to the builder. Finally, do you see designing kites as a definite “goal” these days, or is design innovation something that just “happens” for you, John? 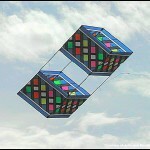 Or is there some other way to understand the subject of “innovation” in kite design? Nothing “just happens” so I guess there is a definite goal. 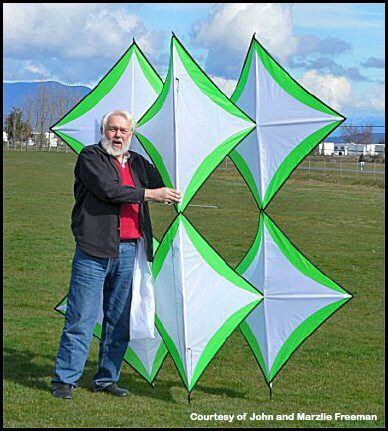 I don’t know how it is with other designers, but I always spend way more time thinking about a kite design than I actually spend building it. Sometimes Marzlie sees me sitting and staring into space with a blank look and she thinks there is something wrong, or I am bored. Nope. I’m designing. 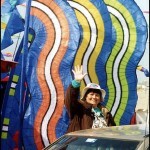 And somewhere in the midst of all this, someone admired your kites and was impressed enough to want you to teach other budding kite-makers to make them. How did all that come about? When did you start teaching kite-making? How many “workshops” have you done now? And what is it about doing kite-building workshops that adds to your enjoyment of kiting? And to give Kitelife readers some idea of “scope” of your efforts, how many kite-building workshops do you and Marzile do each year, and which workshops do you really enjoy? Have you any workshops that are “favorites” for you and Marzile? If so, what is it that’s “special” about those particular workshops? Kiting has become such an integral part of our lives it is impossible to imagine being without it. What with attending all the kiting events we can manage, and doing workshops, and just hanging with other members of our kiting family, life is pretty full. Our neighbors sometimes ask us why we own a house–we are so seldom there. I should mention also that we make other things besides kites with our favorite fabric. 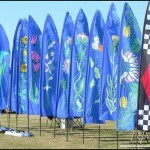 We really enjoy designing, making, and flying banners, or feather-banners, as some call them. 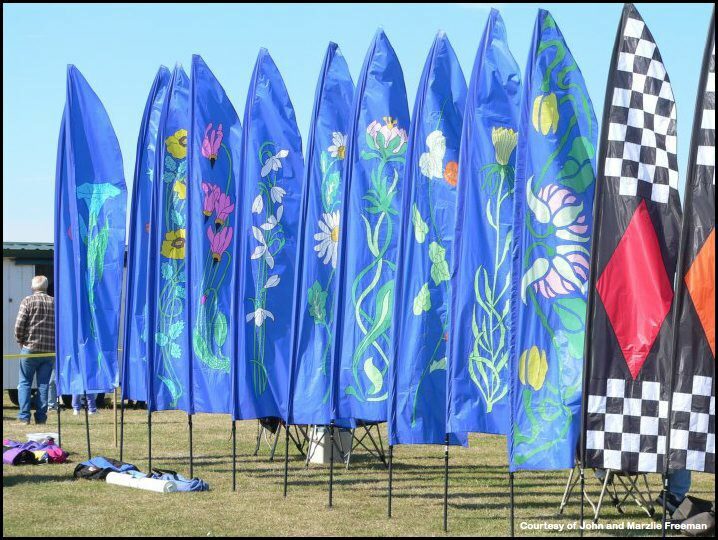 They always add a lot of color, even when the wind won’t hold up a kite.This summer the city of White Rock BC invited us to their summer town festival, Festival of the Sea, to add a festive touch with our banners. On that Saturday, which just happened to be our fiftieth anniversary, we displayed 76 banners. I think that is a record for us on one day! I suppose there’re the occasional moments that stick in your memory as “high points” in kiting and perhaps some accolades you’ve received or events that were quite special. And maybe one fine day comes to mind when it all went right and the world turned absolutely “magical” for you. Or perhaps you saw someone else succeeding that gave you great satisfaction… John, what, out of all your memories and long experience in kiting, still “thrills and delights you” or “tickles your fancy” when you think about it? We all have those days when everything goes right. You’re sitting on the beach, the wind is 7 mph and smooth as a baby’s bottom. It is so perfect you can fly any kite in the bag, and so you do. The temperature is perfect, and all around you are other kiters–the best folks in the world. All right, so that only happens once every year or two, but it does happen, and it is worth waiting for. Still, the thing that probably gives me the most pleasure in kiting is being at a festival and seeing kites in the air that were born in a Freeman workshop. Now that’s a real high! OK – Time to break away from past and present history and ask an “opinion” question. 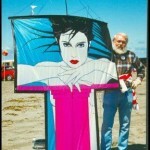 Do you think the sport of kiting will ever return to its “Hey-day” as it was in the 80s and 90s? Will kiting ever become a “Mainstream” sport? 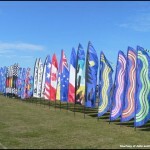 And what do you think we can do to help kiting grow as a sport? We all recognize the kiting family has more than one branch. We belong to the single line branch of the family but we have lots of good cousins who belong to the sport kiting branch. Even some who do both. I think the growth surge that kiting went through then was due to people getting caught up in the rage for sport kiting as the kites became better and better. Kite stores flourished with the sales of sport kites with prices which caused non-kiters to wonder about our sanity. “You spent how much? For a what?” Some, like me, took up single line kites with a passion, and slowly drifted away from sport kites. Others did both. 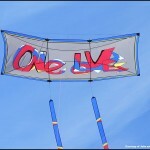 Others, I am afraid, just lost interest, or moved on to the next exciting thing–kite surfing, kite skiing. Maybe we, as single liners, are so laid back we don’t do enough to promote our particular part of the hobby. As for becoming main stream, if we are talking about football or basketball as main stream, then sheesh–I hope not! I suppose I wouldn’t object to being paid millions a year, but I could never bring myself to ask people to pay to watch me having this much fun! 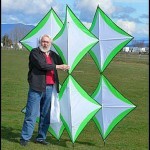 John, you’ve had a good long run as a Kite flier, builder, designer, and teacher. Along the way you’ve certainly made many friends. Who are the people you treasure now? Which friendships have been especially meaningful? And who do you miss dearly? Man Dave–I sure wish you had said “you are having a good long run” rather than “you’ve had a good long run.” I sure hope it’s not over yet. But you are right–We have made many friends. I treasure them all. And we as the kiting family, and I as an individual, have lost too many of them over the last few years. I am still in pain from the loss of the kiter I considered to be the best friend I ever had, but life goes on, and we are still surrounded by much loved friends. And through all this, you’ve been lucky enough to be married to the marvelous Marzile, your partner of how many years? How does she view this kiting stuff? Is she as delighted to have been a part of the kiting community as you are? And what plans do you two have for the future – both within kiting and without? This summer we had our fiftieth anniversary. They have been very good years, but now seems to be the best, largely due to being part of the kiting family. 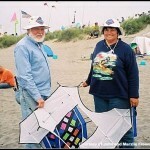 I have also felt fortunate that Marzlie is right there with me in enjoying kiting, kite making, and the kiting family. As for the future–why would we change anything? John, Thanks SO much for taking the time to share all this information with us. 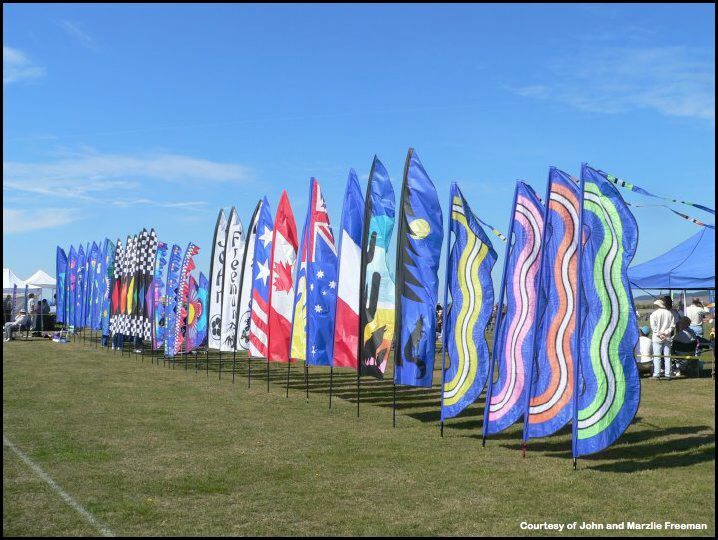 You’ve been such an integral part of the whole kiting scene for so many years that you’re almost a fixture – and one of the great ones at that! We’re delighted to have someone of your caliber share this information with us. Thanks Loads! This entry was posted in 2007, Interviews, Issue 57 (Nov/Dec), KL Archive. Bookmark the permalink.